Odyssey 2011: a crew trains on a submerged model of the ISS in the giant pool at Star City. The Soviet-era space training centre at Star City braces for a futuristic makeover as the mayor hopes to turn it into a star tourist attraction. In a population of 6,700, it will be hard to find anywhere 40 cosmonauts, winners of Heroes of the Soviet Union, the top Soviet medal. But the Star City, once designated as ‘Closed military townlet No.1’ and a highly guarded military installation, in Zvezdny Gorodok is no ordinary place. Home to Yuri Gagarin Cosmonaut Training Centre, it boasts a futuristic array of space training equipment. But entering the complex is like travelling back in time where utilities, roads and buildings are badly in need of repair. Mayor Nikolai Rybkin says 5 billion roubles ($155 mn) are needed for renovation. A former KGB colonel who was elected mayor by a popular vote in 2009, Rybkin has ambitious plans to refurbish this unique enclave of world history, increasing accessibility while maintaining security. He aims to turn Zvezdny into a tourist attraction linked to the capital by a special train, with futuristic hotels, business centres and entertainment venues. However, for all the changes over time, Star City has stayed true to its vocation. The esprit of the space community is tangible everywhere. Hallways bear photos of cosmonauts and astronauts, who underwent training here, including Russians, Germans, Vietnamese, Americans and Chinese. During a recent tour, visitors were shown a hangar containing replicas of the seven-tonne, three-seater Soyuz spacecraft, which with the retirement this year of the US shuttles, will be the only means of ferrying crews to the International Space Station. Then there is the centrifuge, the only facility in the world that simulates not only G-force and acceleration but also weightlessness. Powered by an underground plant, the 305-tonne device with its 18-metre long arm packs the punch of five railroad locomotives. 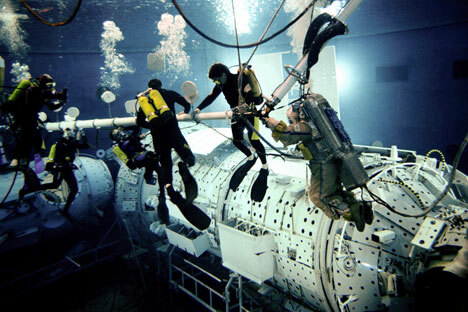 Elsewhere, teams train on a mock-up of the ISS that is submerged in a giant pool to simulate weightlessness. Wearing 145-kg diving suits loaded with weights, they can shed four kg of weight during a four-hour session.